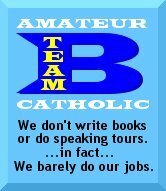 I would like to join the B team, but am not sure that I am qualified. I'm not much of a writer- and my readership consists mostly of a mermaid and a bunch of very well behaved [crickets]. My thanks to Dr. T, also.